This post was originally going to be something far more exciting and labour intensive, but somehow I have this crazy feeling that I can’t complete it without having a certain eyeshadow palette I ordered online from the Sephora VIB Sale in my paws beforehand. Instead, I’m going do one of those old school blog posts where I write a little bit about four products that have disappointed me. It’s true that my dry and sensitive skin doesn’t get along with lots of different foundations but I haven’t been as utterly disappointed in a foundation in years as I was with this one. It does not have great longevity but the worst part is that for a foundation that’s marketed as being skin like and natural-looking, it looks completely unnatural on my skin – even when I don’t have much in terms of dry patches. It also provides only light coverage that might build ever-so-slightly. There are lots of foundations that I find look terrible and mask-like on the skin but it’s been a long time since I’ve found a sheerer more natural and glowy foundation that I couldn’t make work. I’m the ideal candidate for a foundation like this one and if it looked unnatural and covered little on me, I don’t think it’d do much for anyone else. I’m usually quite the fan of Rimmel foundations and this one was so bad I couldn’t even stand to look at my face in this foundation long enough to write a review post of it. There is one positive about this foundation: the shade range features several pale shades. That’s as far as I can go. For the most part, I adore the formula of the NARS Audacious Lipsticks. However, I find that this deep vampy red-leaning berry shade applies in a patchy manner and tends to wear in a patchy manner as well. 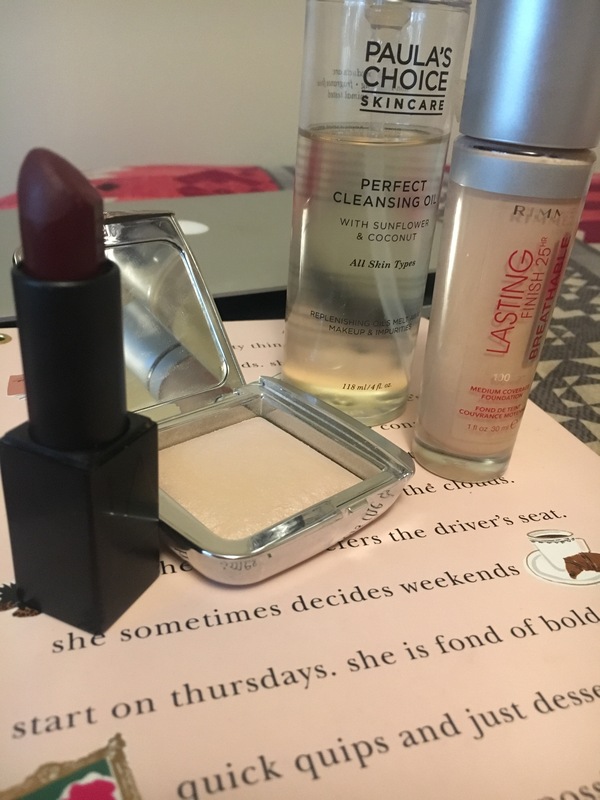 The formula is creamy, comfortable and relatively smooth but I find that I don’t reach for this lipstick because its not the easiest to apply neatly and it’s a higher maintenance option with its creamier texture. I do understand that the formula inconsistancies are likely due to the difficulty in formulating these uber-deep shades. The lipstick looks great if I apply lipliner and blot it but there are other formulas that require less work and maintenance that I would reach for over this one. It’s no secret that I adore the Hourglass Ambient Lighting Blushes and quite like the original Hourglass Ambient Lighting Powders but I can’t say I feel the same way about their strictly-highlighter formula. The powder is incredibly finely milled and isn’t the most unflattering on texture but I’m completely confused by the very subtle sheen it gives off along with the visible micro glitter particles. It’s a pale pink champagne-ivory kind of shade with silver micro glitters that produces the slightest sheen and visible glitter particles. I’m confused by how subtle this highlighter is in terms of effect along with the visible micro glitters. I don’t have anything against a subtle highlighter but the visible particles in a sheerer formula rain on my parade. It’s rare that I try a Paula’s Choice product that I don’t enjoy. I always appreciate the effective formulas that they produce that don’t break the bank and are the most gentle on the skin. I was so excited to try their cleansing oil because I adore using these products to gently dissolve makeup from my skin without any sort of abrasion. However, I have issues with it stinging my eyes (despite being fragrance-free and not having anything questionable on the ingredient list) and I don’t find it as nourishing or as effective at removing makeup as other ones I’ve tried. Really interesting to see some of the more pricier products being disappointing ones too. I can certainly understand what you mean about the Hourglass highlighter – sounds like such an odd finish and like it should be one thing or the other instead of both! Shame about the Rimmel foundation being a total flop too, some of their foundations are pretty good. This was such an interesting post to read and your reasons for not liking these products seem very justified. Was a perfect Sunday evening read! Have a great week, my love!